They stay until the end of every game. They remind their sons to respect those on the team and those competing against them. They bring their sons back down to Earth after a victory and remind them that it's only a game after a loss. These are the mothers of the University of Louisiana at Lafayette baseball players. Designated hitter Tyler Girouard of Youngsville admits that he grew up a "little mama's boy." It's only to be expected since he not only spent the time at home with his mom, Allison Girouard, but also went to school each day with her since she was a teacher at St. Cecilia Catholic School in Broussard. "She's made me who I am," Tyler Girouard said. "I just learned a lot from her, being around her all the time." The single word Tyler Girouard uses to describe his mother is "supportive," and the greatest lesson he has learned from her is to have fun and listen to his heart. Allison Girouard is most proud of her son for his determination on and off the-field. "When he sets a goal for himself, he's going to work to the best of his ability to reach that goal," Allison Girouard said. "He's very determined." What Tyler Girouard wants his mother to know today most of all is how appreciative he is for everything she's done for him. "She does a great job of being a mom to my sister and I," Tyler Girouard said. "I love her. She means a lot to me. She's always there when I need to talk to her." Third baseman Ryan Leonards of Crowley describes his mom, Debra Leonards, as a "feisty Cajun" who always helped bring him back down to Earth when he became too proud. "She's always told me from day one to always be humble and kind to others because you never know what kind of impact you're having on somebody's life," Ryan Leonards said. "You never know who's looking up to you, trying to be like you or looking to you for motivation." Some of the best advice his mother has ever given him is not to focus on himself but on the team because that's what baseball is all about. Because Debra Leonards played softball her entire life, she passed her passion on to her son, whose passion for baseball is evident to anybody who knows him. "Baseball is his life," she said. "I think it's going to break his heart when he's not playing anymore. Just thinking about it makes me want to cry." Even though his Ragin' Cajuns baseball career will soon be complete, Debra Leonards knows her son will be fine because he's grown up to be "quite the young man." And Ryan Leonards knows he wouldn't be who he is today without his mom's influence. "I love her, and I appreciate everything she's done for me over the years and everything she'll do for me in the future," Ryan Leonards said. "And I love her more than anything in the world." 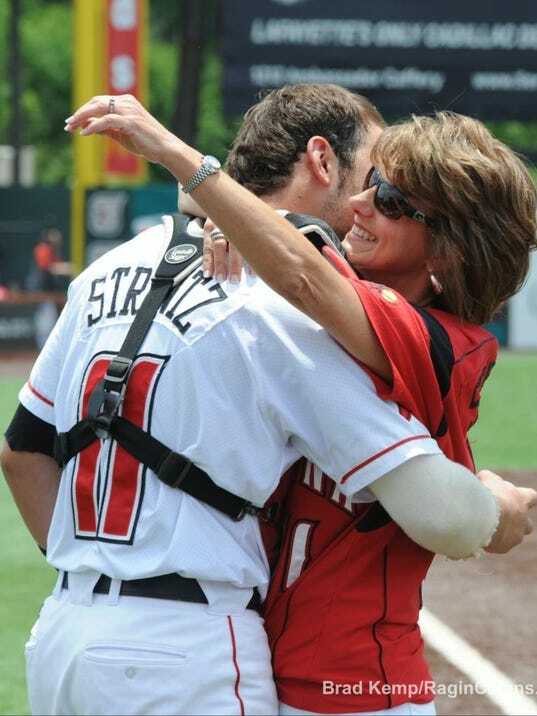 Catcher Michael Strentz of Lafayette describes that his mom, Christine Mikolajczyk, as his No. 1 fan at every baseball game. "No matter if I do good or bad, she's standing behind me supporting me, even if nobody else is," Strentz said. The single word Strentz uses to describe his mother is "caring," and the best piece of advice she has offered him is to leave a path that he would want his kids to take. "My mom has helped me to become the man I needed to be," Strentz said. "Not only on the field, but also just to survive in the real world." Mikolajczyk said baseball has taught her son discipline, teamwork, success and humility. Her son's baseball career also has given her the opportunity to travel many places she might not have visited. "We've missed only two or three games his whole college career," Mikolajczyk said. "It's good support. We can see — especially at home — he'll look in the stands to see who's all there. He never says anything, but he checks to see that his family is there." Even though he may not say anything at the games, Strentz knows how lucky he is to have his mom cheering him on — both in the stands and in his life. "I just want to thank her for supporting me and being there for me no matter what," Strentz said. "I love her, and she means the absolute world to me."